Receipt for meals for prisoners made out to W.J. Culver. WHC Collections 1994.056.0023. In pulling together materials for our exhibit about Salem Restaurant History, we came across this receipt (WHC 1994.056.0023) for services made out to W.J. Culver. Knowing from other tax receipts and sources that a W.J. Culver had served as Marion County Sheriff, we found this quite intriguing. 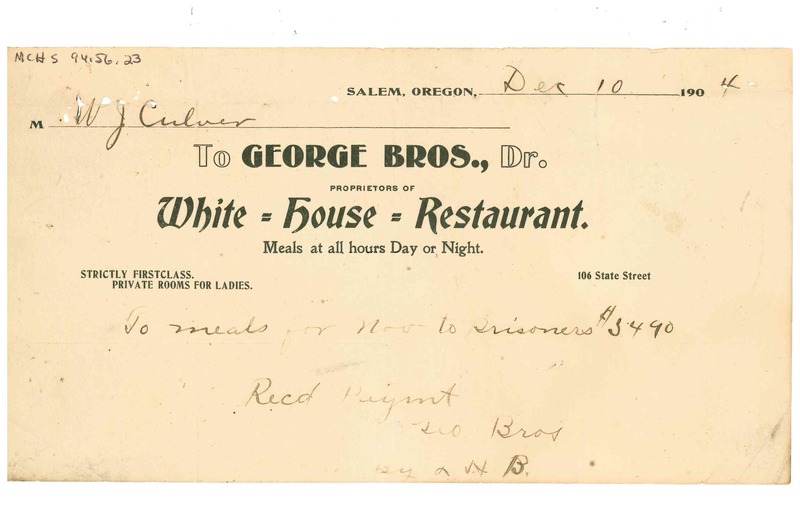 As it turns out, this receipt is proof of a long-running practice in Salem of local restaurants providing daily meals to prisoners at both the City Jail (located in the old City Hall at the SW corner of Chemeketa and High Streets) and the County Jail (located in the Marion County Court House on the NW corner of State and High Streets). In 1900, William J. Culver, 33, is living with his widowed mother, Louise. He is a prospector who has been out of work for 5 month in the previous year. Interestingly enough, his next door neighbor, John Stapleton, is a guard at the prison shop. William died 20 August 1929 (death cert 627, Marion County). 1900 US Census, Prospect Precinct, Marion County, Oregon, enumeration district 127, Sheet 2B, p. 48 (stamped on 2A), dwelling 36, family 37, Louise Culver household; Ancestry.com (http://www,search.ancesttry.com : accessed 19 Mar 2015); citing NARA film T623, roll 1348 and FHL film 1241349. 1910 US Census, 1925 State Street, Salem (Ward 6), Marion County, Oregon, enumeration district 226, Sheet 11B, p. 101 (stamped on 11A), dwelling 264, family 276, William Culver household; Ancestry.com (http://www,search.ancesttry.com : accessed 19 Mar 2015); citing NARA film T624, roll 1284 and FHL film 1375297. 1910 US Census, 185 S 19th Street, Salem (Ward 3), Marion County, Oregon, enumeration district 473, Sheet 2A, p. 48 (stamped), dwelling 34, family 36, James W. Culver household; Ancestry.com (http://www,search.ancesttry.com : accessed 19 Mar 2015); citing NARA film T625, roll 1498 and FHL film 1375297. This entry was posted in Artifact Spotlight and tagged 1904, 1994.056.0023, jail, Marion County Courthouse, Restaurants, Salem, Salem City Hall, White House Restaurant, William James Culver. Bookmark the permalink.